Last Saturday Henry Boreland welcomed 101 golfers who took part in Kilrea Golf Club’s 99th Captain’s Day. In spite of the very wet conditions, scoring was surprisingly good with the winner, Kieran Mulligan, the former club treasurer, accumulating 42 points. 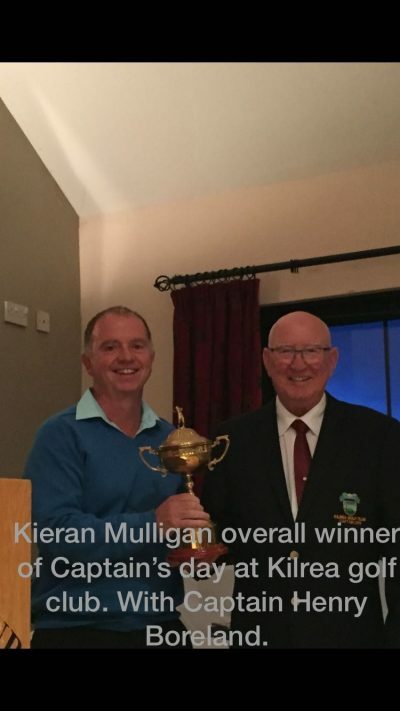 This enabled Kieran to pip club stalwart Gerard Donaghy, who returned a very creditable 41 points. Sean Dempsey continued in his recent rich vein of form, signing for 40 points and securing 3rd place on countback. His playing partner and fellow Pierce Purcell team member, Aaron Hayter, took the Council prize with a total of 40 points. The gross prize went to another of the club’s young guns, Ciaran og O’Kane, who covered the 18 holes in 74 shots. The front 9 prize went to Gordon Rees who scored 21 points, while the back 9 prize was scooped by Robert Kelly, who managed a remarkable total of 25 points on the homeward run. Seamus Quinn, another long-serving member, won the past Captain’s award with a steady 36 points. With Seamus claiming the past Captain’s honours, the prize for the seniors went to the redoubtable Joe McCloskey, who has only recently joined the ranks of the veterans. Nearest the pin on the 2nd hole was secured by the youthful man of agriculture, Philip Bradley, while the muscular Patrick Quigg won the prize for the longest drive. On the previous Thursday the club’s lady golfers contested four prizes presented by Captain Henry. The front 9 and back 9 honours went respectively to Veronica Kelly and Sheila Kearney, while Hazel McAteer filled 2nd spot overall with a total of 36 points. The winner of the ladies’ prize was Bridie McCloskey, wife of Joe but clearly nowhere near the veteran stage, who returned an impressive 37 points. While the weather was challenging, after a long spell of glorious sunshine, the day was a roaring success with a great atmosphere on and off the course. An impromptu raffle raised over £400 pounds for the NI Children’s Hospice. The Captain concluded proceedings with a typically witty speech, which ranged over issues as varied as American golf tourists and horse-drawn ploughs. There were numerous references by members to the quality of the prizes on display, a reflection of Henry’s generosity of spirit and his love for Kilrea Golf Club. Everyone at the club wishes Henry good fortune for the rest of the year in his role as Captain.